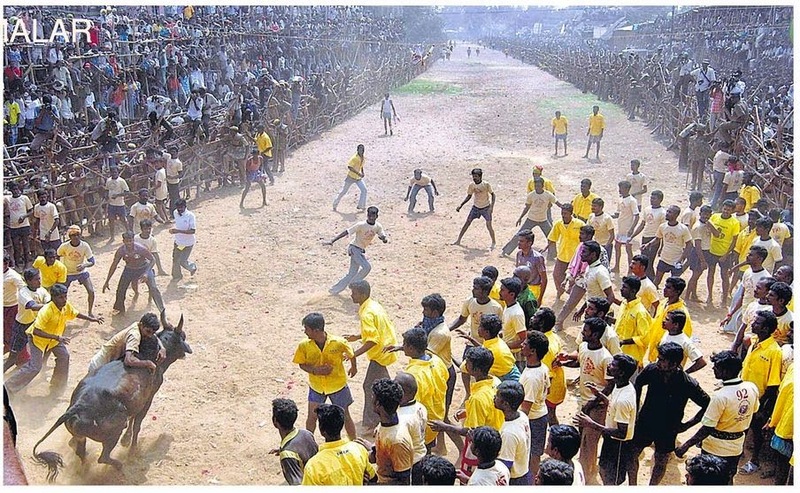 Jallikattu is a South Indian celebration involving bull taming, somewhat similar to the Spanish running of the bulls. It is held in the villages of Tamil Nadu on the eve of Mattu Pongal, one of the four days of Pongal festival (usually January 15 on the Western calendar). The one held in Alanganallur, near Madurai, is the most popular. 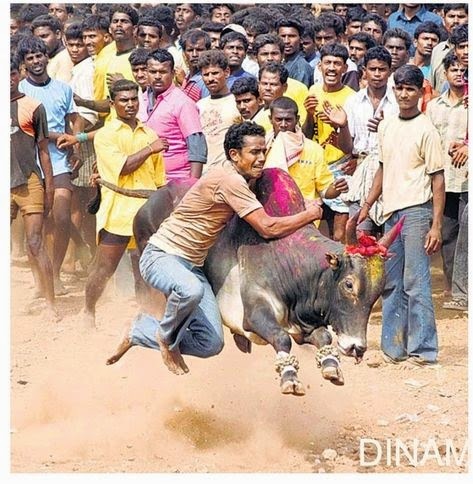 This sport is also known as "Manju Virattu", meaning "chasing the bull. In Jallikattu, an agitated bull is set to run in an open space. Several people, empty handed, try to tame it by controlling its horns. The winner gets a prize, which is generally tied to the horns of the bull. On SOME occasions, the bulls are intoxicated with alcohol. Only men take part in this macho game. Sometimes, more than one bull is loose at the same time. The village farmers take this game as a display of their masculine strength. Betting is also common during the game. 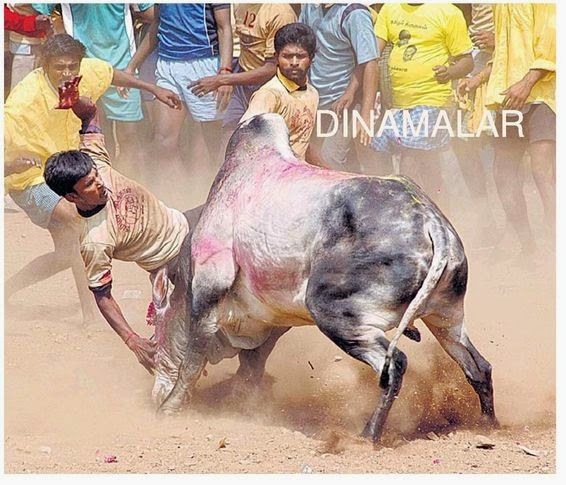 The term Jallikattu comes from the term "Salli" kassu (coins) and "Kattu" (meaning a package) tied to the horns of the bulls as the prize money. Later days during the colonial period this term got changed to Jallikattu which is the term currently used. Usually the majestic Kangeyam Bull is involved in this game, as they are naturally more ferocious and muscular than any other of its species. On Tuesday, 16th of Jan 07, Jallikattu was held in Palamedu which is a panchayat town in Madurai district.Thousands of thrilled audience witnessed the traditional adventurous sport . This year as the event was subject of Court permission, organization was good. The police had erected barricades and left the arena open only to the bulls and those who braved to challenge them. Decorated bulls with sharp horns were left out through a narrow passage one after the other as the waiting youths displayed their valour in an attempt to tame them. Those who managed to cling on to the hump for some distance were declared winners. A wide range of prizes such as gold coins, cash, wristwatches, dress materials, goats and hens were given on the spot. Unmindful of the scorching sun, the visitors witnessed the six-hour show that left at least 50 persons injured. 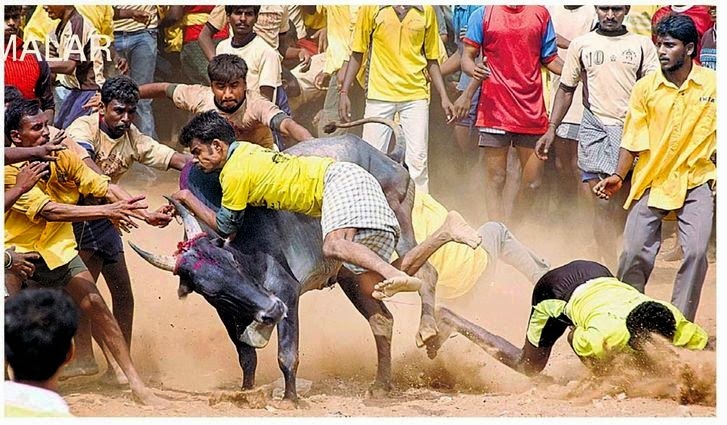 Since two persons died and more than 450 were injured in the `jallikattu' last year, many precautionary measures were taken to minimise casualties. Several medical teams with life-saving drugs and ambulances were stationed at the venue to attend to the injured. The officials checked every contestant with breathalysers and those found to have consumed alcohol were not allowed to participate. Amidst complaints of cruelty to animals, the Madurai Collector, T. Udhayachandran, directed veterinary doctors to examine the bulls at least three hours ahead of the event. The entry of 15 bulls was also rejected as it was found that they were forced to consume tobacco and camphor in an attempt to make them more ferocious. 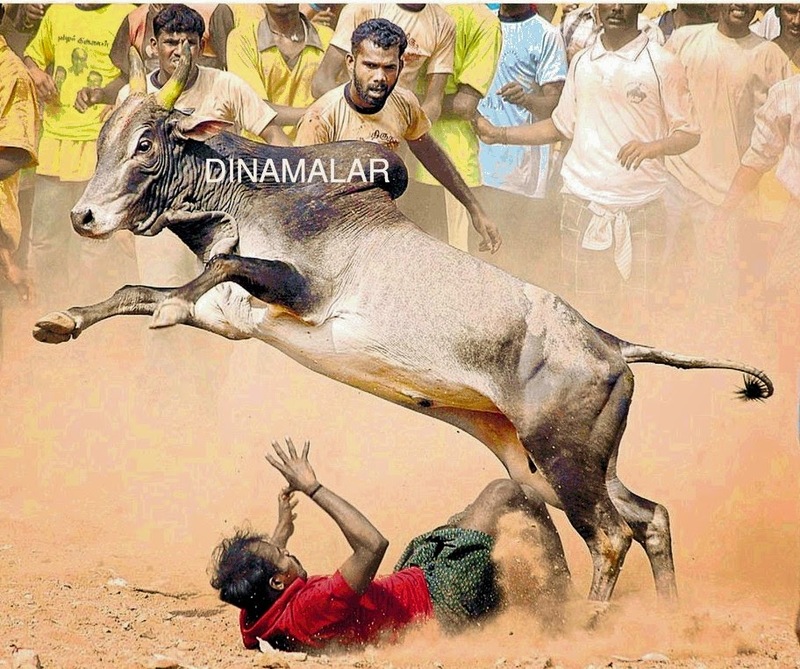 Circulated in Jan 2007 ~ all photos from Dinamalar, the Tamil daily.